There is no question one can use a virtual world to learn or train but there is a question still hanging over what educational benefits MUVES can provide when compared with other educational electronic learning techniques and face-to-face Real Life teaching. There also is the question whether virtual worlds can be separated from Real Life as a stand-alone teaching aid, particularly in distance education, or whether they are just another useful tool in the education toolkit; just another classroom/space on the Real Life campus? These thoughts were brought to mind by the recent blog by SLENZ co-leader Terry Neal (SL: Tere Tinkel) on “The barriers to using Second Life” and the PookyMedia machinima promoting midwifery student use of the SLENZ Project’s pilot Second Life midwifery education programme at Te Wāhi Whānau, The Birth Place, on Kowhai, being run in conjunction with Otago Polytechnic. The conjunction of the two sparked a discussion with my three-year, virtual-world, travelling companion, Wendy Steeplechase (pictured right), who believes that the “memories” created in Second Life, because of the nature of virtual world “immersion”, have the same “feel, qualities and weight of real life memories” when compared with the memories created by more passive entertainment/information delivery such as reading a book or watching television or a movie. This is important when one considers the role of memory in learning. “For me,” Wendy said, “those more passive forms of information input don’t create the strength of the memories created by Second Life. I would never confuse a memory I have of reading something in a book with me doing it in Real Life. But it does happen to me in Real Life that I sometimes don’t know whether the conversation took place, I saw the place, or the event happened in Second Life or Real Life. But that’s because of the 3 Dimensional, graphical quality isn’t it? “In business I have found people very leery about the use of web cams,” Wendy who is “immersed “in Second Life but also controls large Telecons in Real Life on an almost a daily basis, said. “People do not like to do live video in a science/business environment. But the level of anonymity and the artificial, perceived (safety) barrier one gets with an avatar within a virtual world makes people more comfortable with a virtual world than with video conferencing, where everyone sits rigid and doesn’t really dare to relax or move naturally. “This comfort level is evidenced by the relationship situation in virtual worlds where people get so close to each other so quickly. It is also evidenced by the fact that virtual world residents are comfortable exploring alternative lifestyles and places they would never even consider doing or visiting in a million years in Real Life. “The ability to interact with this ‘safety barrier’ in place makes virtual worlds far more compelling and palatable than doing the same thing in Real Life or watching videos or movies,” she said. The big negative of virtual worlds for Wendy is the fact that avatars, except for walking, can only move in prescribed animations. For instance they can’t point at things with their hand or fingers; and their arms, except in prescribed animations, cannot be moved. This, she believes, works against true roleplay learning in Second Life for many applications. For instance, she said, as a pregnant woman having a baby she would want to be able to point to where the pain is and the Real Life midwife would need to understand this. For her – and she is at pains to point out she is not an educator – one of the most compelling training uses of Second Life is the international border crossing simulation created by Loyalist College, of Ontario, Canada. It works, she believes, because the two partipants in the roleplay are fixed in space and time and do not move very much. She views the interview room of the SLENZ Project’s Foundation Learning pilot, with its fixed avatar and fixed interviewer, in the same light, although neither Loyalist College nor the SLENZ pilot takes great advantage of the 3D environment for their roleplay. Critical of my view that academics need to be “immersed” before they can “champion” Second Life as an educational tool or teach in Second Life, Wendy believes that not everyone is capable of becoming “immersed” in a virtual world. “Just as there are different learning styles,” she said, ” there are different styles of being. Not everyone will ‘get’ virtual worlds, no matter how hard they try. I’ve come across many, many residents who have spouses or partners who think it is absolutely stupid and a waste of time, even after they try it, and even if they really want to share the experience. 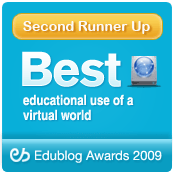 “It’s unfortunate in those cases but that is the way it is: for educators/businesses virtual worlds can only ever be one tool in a toolkit which might suit some and not suit others.